More surf on the way this week to the Hawaiian Islands! Weather forecast looking at light winds for another day before the trades make a brief come back midweek. Waves in town and country on the rise so wax up your boards. Our photographer, Chris Rust captured Lena Ching ripping it up at one of our secret surf spots. Accessible only by boat, this is probably one of the best rights in the world. This photo will hang on Lena's refrigerator for the rest of her life. The weather today was picture perfect! In fact it has been like this the past month. Everyday the winds are light and variable and excellent for a day at the beach. 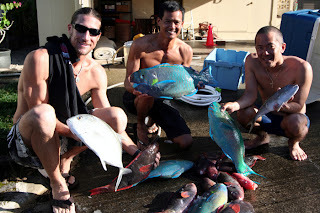 I dove with Patrick McCreary (left) and Keith Yamane (middle) today and we got a few fish for the barbeque. It's great to spend time with good friends doing what we love. Who know's 25 years from now we may be only talking about those good ol' days. Wow, it's not very often you can go out at spear a dogtooth "doggie" tuna. 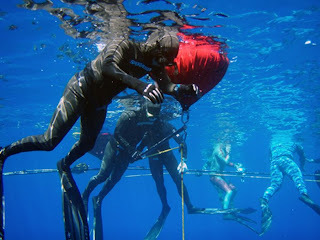 On a recent trip we did to the Ryuku Islands, we joined up with Kirby Fukunaga, Reyton Siliado, Kevin Burril, Keith Camardo, and their friends for a Hawaii Skin Diver film shoot. 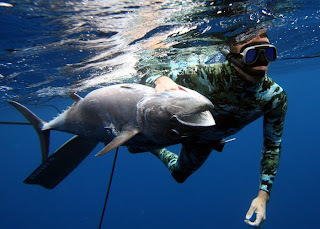 Kirby got this sick shot of Kevin's fish caught on tape and made the cover of Hawaii Skin Diver Magazine. Check out www.go-naminori.com for more of Kirby's work.